The first weeks of 2017 in the UK have been filled with news that the NHS and social care are in crisis, due to a lack of government funding. It has been shocking, in one of the wealthiest countries in the world, to learn of patients dying on trolleys while they wait to be treated, and of the huge stress and strain NHS staff are under during what the Red Cross has described as a ‘humanitarian crisis’. 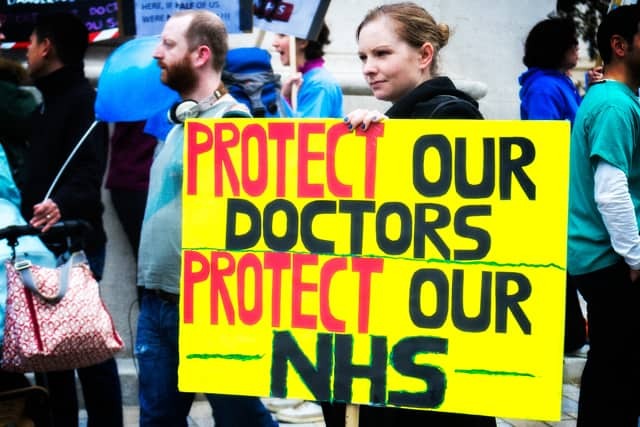 Yet despite all the focus on NHS underfunding, there has been little attention paid to one of the significant financial strains being put on the health service here in the UK – that of the Private Finance Initiative (PFI). For even as we campaign for countries around the world to have the funding they need to develop public health services, the precious resource of the NHS in our own country is being undermined by the kind of unjust debt burden we’ve spent decades fighting in the global South. We know that our public health system is valued dearly by many Jubilee supporters, but up to now the issue of NHS debt has not been on the agenda of our campaign in the UK. It’s time to change that. The Private Finance Initiative is the name used in the UK for public-private partnerships, a form of financing of public infrastructure which has spread around the world over the last two decades. In the NHS, a PFI hospital is built when a consortium of private sector banks and construction firms finance, build, own, operate and lease hospital buildings and services to the UK taxpayer, typically over a period of 30 or more years. The main advantage of this arrangement is that the costs of building new hospitals do not count towards the national debt. But this public accounting trick comes at an enormous cost. Take Calderdale Royal Hospital in Halifax. It cost £65 million to build, but over 30 years, £312 million has to be paid to cover the PFI debt and interest costs. If the money had been borrowed publicly, it would have cost an estimated £127 million. So the hospital will cost £185 million more than it should have done – enough for another one and a half hospitals. Overall, the National Audit Office has found that private finance costs at least twice as much as if the government had borrowed to build the hospitals itself. Spread that out over more than 100 PFI hospitals, and it’s easy to see why the NHS is paying out over £2 billion every year to private companies on PFI contracts which stretch out for many years into the future. This ‘NHS debt’ was a major contributor to the record £2.45 billion deficit faced by NHS hospitals in England in 2015/16. Cash-strapped hospitals are even more hard up while profit-making companies benefit. We think that it’s time that the public and decision-makers know just how bad PFI debts are for our NHS and for the hospitals we all rely on. Access to good quality, affordable healthcare is a basic human right and is being threatened by NHS underfunding and PFI debts. This affects everyone in the UK reliant on our celebrated NHS, but especially the people who need it the most: the poorest sick and elderly people, mothers and children. We need to demand an end to crippling PFI debts so that crucial NHS funds go towards treatment and care rather than profits for corporations. Plus, while we try and warn the world of the global debt iceberg caused by these kinds of public-private partnerships, it also falls to us to show that it is possible to fight back against the logic that ‘there is no alternative’ to private finance. That’s why we’re asking you – Jubilee supporters – to get active with us on the issue of NHS debt in 2017. As a first step, on Saturday 4 March we’ll be joining the #OurNHS march through central London to spread the word about NHS debts. If you want to join us at the march, there are coaches coming from all over the country. The march is assembling at Tavistock Square, London, WC1 – close to Euston train station – at 12 noon. If you would like to join the Jubilee block on NHS debt, please email clare@jubileedebt.org.uk and we will let you know our exact meeting location when it’s confirmed. If you can’t make it in person, we will have copies of our leaflets about NHS debt available soon so that you can spread awareness in your area. Again, please email clare@jubileedebt.org.uk if you’re interested in them or keep an eye on our website for more. And if you’re on Twitter, please join in on social media using the #OurNHS hashtag. And follow @dropthedebt on the day to share our tweets regarding NHS debt. We hope you’re ready to get active with us in 2017 to take on the unjust NHS debts impacting hospitals up and down the country.